These are the TDWG by-laws adopted by members in 2006. They specify organisational and procedural framework for developing and ratifying TDWG standards. Interest Groups and Task Groups are the organisational entities responsible for investigating and creating specifications that enable biodiversity information interchange. An Interest Group provides a base for discussing problems, goals, strategies, methods and the application of generic technologies. A Task Group is created within Interest Group to develop a specific product within a specific time frame. An Interest Group is also responsible for maintaining the products of its past Task Groups. Evaluate the needs of TDWG members against available methods and technologies; Develop consensus around new approaches to information sharing; Create Task Groups to create specific products within specific time frames; Maintain and update products that continue to be useful. A TDWG member can petition for the establishment of an Interest Group by submitting an Interest Group charter to the Executive Committee. The charter specifies the mandate and operation of the Interest Group. Interest group charters undergo public review and comment. If the Executive Committee judges a proposal to be problematic, it may return the proposal to the submitter with justification but without public review. The Executive Committee should return a decision and explanation to the proposer within 30 days of acknowledged receipt. The approval of an Interest Group charter is announced to the TDWG members. This action formalises the establishment of the Interest group, and authorises the establishment of the group's collaboration facilities. A TDWG member can become an interest group member by joining the group'scommunication system and meeting any other requirements prescribed in the group's charter. the Interest Group is not fulfilling the requirements under its charter. In the former case, the report should be edited and re-submitted. In the later case, the Executive Committee may reorganise or disband the Interest Group. An Interest Group charter can be revised at any time and submitted to the Secretary as a draft. A draft revision may reflect minor corrections or clarification, or may reflect a change in operation or purpose. The Secretary may approve minor changes, but must distribute any substantive revision to the Executive Committee for review and approval before it replaces a prior charter. The only formal position required in an Interest Group is the Convener, who is responsible for managing the group's operations. The Convener may appoint group members to other roles as required. A Task Group is created within an Interest Group to develop a particular product within a given time frame. The charter for any new Task Group must be submitted to the Executive Committee by the Convener of the parent Interest Group. The Task Group Charter must include a schedule of milestones and products. The Executive Committee should seek external review as appropriate and render a decision to the Interest and Task Group Conveners within 30 days of receipt. If the charter is approved, the Executive Committee announces the formation of the Task Group to TDWG members and authorises the establishment of the Task Group's collaboration facilities. the Task Group is not fulfilling the requirements of its charter. In the former case, the report should be edited and re-submitted. In the later case, the Executive Committee may reorganise or disband the Task Group. A Task Group charter can be revised at any time and submitted to the Secretary as a draft. A draft revision may reflect minor corrections or clarification, or may reflect a change in operation or purpose. The Secretary may approve minor changes, but must distribute any substantive revision to the Executive Committee for review and approval before it replaces a prior charter. The only formal position required of a Task Group is a Convener. The Convener may appoint other positions as required. Members of the Task Group are defined by joining the group's communications system and meeting any other requirements specified in the charter. By definition, a member of a Task Group is also a member of the Interest Group that created it. When a Task Group believes that a working draft is ready for wider review, the Task Group Convener submits the working draft and appropriate documentation as a package to the Executive Committee via the Secretary. The Secretary notifies the Executive Committee of the submission and requests a decision on advancing the draft. This decision must be made within 30 days of receipt of the draft. If the response is positive, the Executive Committee appoints a Review Manager to seek appropriate independent and expert reviews. If the response is negative, the Secretary reports the decision with justification to the Task Group Convener. The Review Manager submits the reviews along with a summary and recommendation as a package to the Executive Committee. request a new revision to address specific problems. Public Review. The Executive Committee directs the Proposed Standard to be placed in the TDWG repository, publishes a request for comment (RFC) that describes facilities for, and duration of public comment. A minimum of 30 days must be allowed for comment. At the end of the comment period, the Task Group may modify the specification or its documentation as necessary. Any subsequent submission should address the comments received in the public review. Accept as a Standard - A draft is accepted as a Standard and its status in the repository is updated accordingly. A specification must have been through at least one round of public review before the Executive Committee may accept it as a Standard. Figure 1. 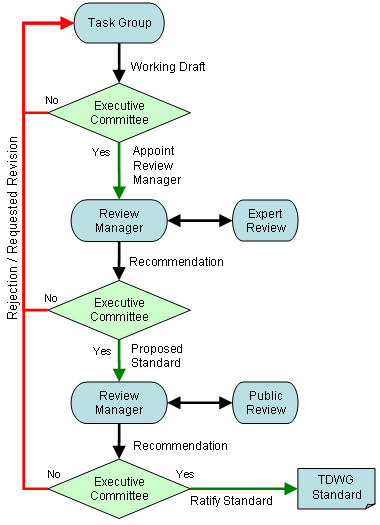 A flowchart illustrating the pathway to ratifying a TDWG standard.